Why did they make a Neotec 2? What are the differences? If you have ever asked yourself these questions this blog is for you! 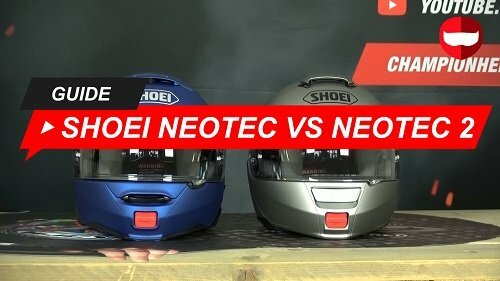 Here we take a look at what has changed between the original Shoei Neotec and the Shoei Neotec 2. When you look at the original Neotec and the Neotec II it can be quite difficult to one from the other. They are both quite similar, especially in appearance but it is the aspects in which they differ that the Neotec II really shines. Let me start with a little bit of background. The original Neotec was released in 2011 and was a great success which made Shoei one of the top modular helmet brands around. Since then Shoei has been hard at work trying to become the top modular helmet brand and they ended up releasing the Neotec 2 in 2018. So there was a pretty long wait but it was time well spent. You can follow this if you want to see a review of just the Neotec II because in this blog the focus will be solely on the differences between the 2 Neotec models. The most important difference I think is that the Neotec 2 was designed in a wind tunnel and what that means is that they have made it more aerodynamic, improved upon the ventilation and reduced noise pollution. The Neotec 2 looks just slightly more aerodynamic but there are some strong indicators of this testing on the shell itself, if we look a little harder. At the bottom of the chin we have a spoiler on either side and this helps split the air around the helmet, while the original is mostly smooth. The visor also blends a bit better into the shell while for the original it was built into a raised section of the shell. The top vent is smoother, we have a double spoiler on the back and a little neck spoiler at the bottom of the shell. These are all things that came out of the wind tunnel and just improve upon the original Neotecs design without radically changing it. Just keeping to the shell of the Neotec II, it looks like a more advanced design because of all these changes. There is simply more to this helmet and the influence of the wind tunnel has helped to give a more sporty look. The ventilation got a nice little boost as well on the new Neotec II. On the chin of the original Neotec helmet you will find a wide push to open chin vent which cracks more than opens. This was nice but it didn't give a lot of ventilation. What they did on the Neotec II was change it to a sort of lip vent. You can just push it down and it will catch the wind and force it into the helmet. This vent is more effective because it stands out a bit more, scoops the air into the helmet and should be easier for you to find. The top vent kind of just stands out on the original Neotec bu on the Neotec II it is more integrated and has a divider on the inside to better channel the air. So it is more aerodynamic and effective. Both are vents are controlled by sliders though and can be pushed into 1 of 3 positions. The rear exhaust vent has also been changed on the Neotec 2. On the original it had an open or closed position but that is gone with the new Neotec. It wasn't really needed and I doubt anyone will miss closing the rear vent occasionally. The better aerodynamics and ventilation has really helped with the noise reduction too. The Neotec II is much better in keeping excess wind noise out and that wind is the main cause of noise. The visor of the Neotec II got an upgrade in this regard too. Basically it was given a closer and stronger fit to the shell to keep wind from leaking in. On the underside we have a few improvements too. You will find on the original that it has a chin wind guard but that has been made bigger on the Neotec II. Also the neck-roll has a smaller opening to lock better around your neck and we have some extra materials by the chin straps. What this means is that the neck opening has been made almost airtight to stop excess noise from entering the helmet. The cheek pads also got an upgrade from to become noise isolator cheek pads. These have all been big improvements for the Neotec 2 and has made this one of the quietest modular helmets around. The rest of the changes that have been made include, the Neotec II chin bar will lock solidly up on top of the brow in an open position and the original Neotec would be stable but just not as strong. The inner liner of the original Neotec has clips by the brow which you could possibly feel depending on your head and how you wore the helmet but they have been removed. The original Neotec was communication prepared, so it could fit most brands but the Neotec II has been specifically prepared for the Sena SRL 1 communication system which basically just has to be plugged in and connected. The sunvisor slider has been moved a little lower on the Neotec II but the biggest difference is that they managed to completely eliminate the noise pollution entering the helmet from the internal sun shield slider. The Neotec II looks a bit more robust, has a thicker face shield and both helmets also weigh about the same. So there are a few differences as you can see between these 2 helmets. These have been pretty much all the differences that I could between the original Neotec and the Neotec II. In general the Neotec II is the better helmet, in every single way which is exactly what you would expect from a second generation helmet. The original Neotec is still a great helmet though and if you still have one, don’t think that it isn’t good enough anymore. If you are or were happy with your original Neotec, the Neotec II should only be better for you and the Neotec II still feels just like the original. Both are robust, have a comfortable fit internal sun shield, the same riding position and all of the important stuff like an eps liner, a 3D injection molded shell, micro ratchet and everything like that. The Neotec 2 is simply the future for Shoei and that is why we have seen more and more designs released since its release in 2018. Shoei will continue to support the Neotec 2 with new designs and graphics well into the future. Because the original Neotec is being phased out by Shoei, we will not be getting any new designs for that helmet. After all, the Neotec 2 has made out top list of modular helmets and is perhaps my favourite in that category.